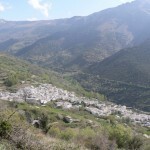 Trévelez is the highest village in Spain, surrounded by dramatic countryside that makes it a great base for trekking. There are also lots of pretty villages where you can sample some of the hearty specialities of the Alpujarras. There are a wide variety of small hotels, guesthouses, self-catering and camping options in Trevélez and the surrounding villages.